Kids. You endure hours of painful labor to bring them into this world. You spend the next 20 plus years feeding, clothing, nurturing, and educating them and then the little ingrates up and leave you! I know, I know, this is the way it’s supposed to be. The goal is to raise them to be responsible, self-sufficient adults who will go out in the world, become successful, and validate our parenting. And I am absolutely certain that the parents of 30-year-olds who are hanging out in their pajamas, playing video games, and living in their basements would be ecstatic to change places with me. Who would have guessed that I would find myself pining away for dirty socks on the floor and the dulcet sounds of the Back Street Boys being played at ear-splitting decibels? The fact is that I do miss it all (even, heaven help me, the boy bands.) When my eldest daughter, Hayley moved out, I couldn’t even walk past her room for the first six months. It felt as empty and desolate as Filene’s Basement after a “Running of the Brides” sale. When she took her belongings, all that remained was a few sticks of furniture surrounded by battered lime green walls and a shockingly stained carpet. My daughter’s room underwent several changes throughout her childhood. After she outgrew her adorable Beatrix Potter themed nursery, I created a Mary, Mary Quite Contrary’s Garden big girl room. It featured Laura Ashley floral bedding, watering can lamps that I wired using hardware store lamp kits, and silver bells and cockle shells that I hand painted on the ceiling. The third incarnation of my daughter’s room was when she became a teenager. This period, as I’d later come to think of it, was the beginning of the end. Suddenly, my precious baby began to have opinions. Like all adolescents, she wished to assert her independence and apparently, this meant that we had to paint her bedroom a sassy lime green. Needless to say, this was not my first choice, but not wishing to deal with a pouting petulant teen, I acquiesced. Her chosen super-bright color scheme of orange, fuchsia, turquoise, and lime green didn’t exactly coordinate with the delicate French-style suite of girls’ furniture we’d inherited from my in-laws. However, determined to (in the immortal words of Tim Gunn) “make it work.” I took brush in hand and proceeded to paint all four matching furniture pieces white with fuchsia drawer pulls. I also reupholstered the desk chair and made a window treatment out of 20 three-inch wide multi-colored grosgrain ribbons. Believe me when I say it was pretty rad. Fast forward to her bedroom’s current state of sorry abandonment and my quandary about what to do with it. My first instinct was to leave it intact as a shrine to my wayward child. 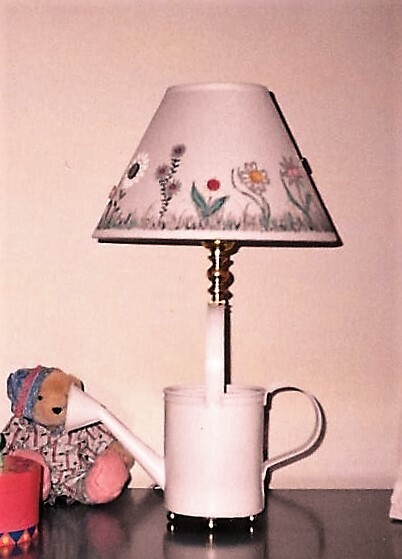 But I quickly discarded this option because, even if I could restore it to its former questionable glory, it now really needed to function as a grown up guest room for both my daughter, if she ever deigned to visit, and for other visiting family and friends. Faced with my ever scant pocketbook, I had to design a modern adult space utilizing a room full of dainty little girl furniture–no small feat! After much agonizing, I decided to go with a feminine art deco style in cream, brown, silver and aqua. (Note to self, don’t paint walls lime green unless you like painting so much that you are willing to spend a heck of a lot of time covering it up). Many hours and gallons of paint later, I had three cream walls and one chocolate brown accent wall, as well as quite a bit of paint in my hair. The wood furniture was transformed with aqua semi-gloss, and silver pulls, and I also sprayed the previously white aluminum headboard silver to match. 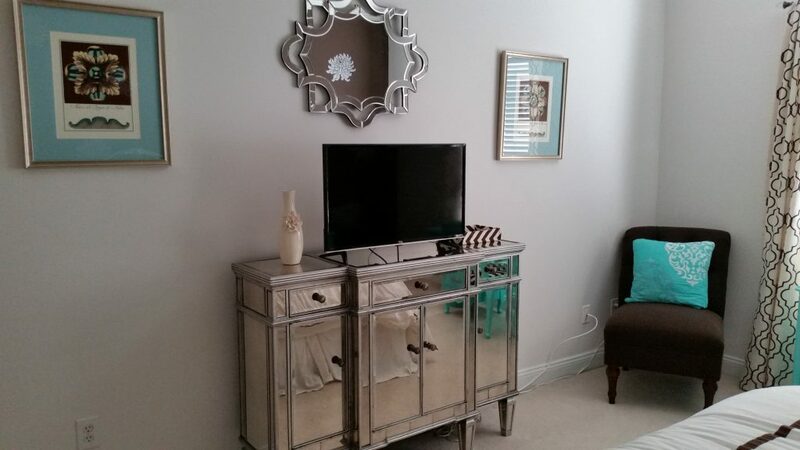 I did purchase a few new pieces, including a gorgeous mirrored buffet, which I got from Pier One, and a brown slipper chair from Target. Overall, I was satisfied with my design, but there was just something missing. It looked classy but lacked pizzazz. 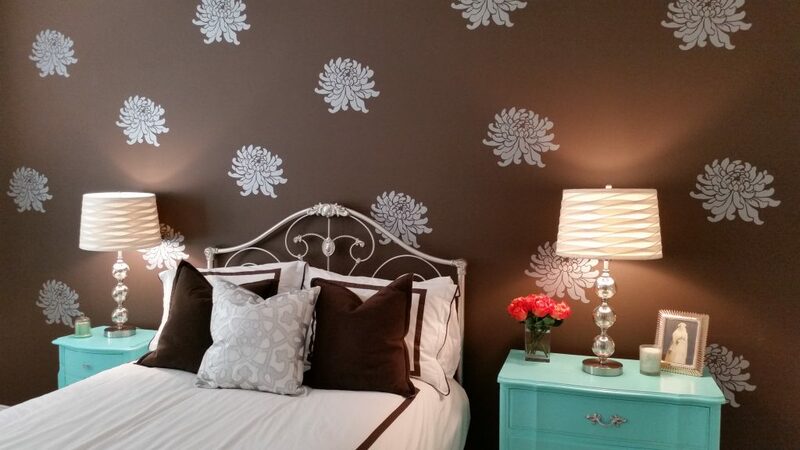 I thought perhaps, I should have used patterned wallpaper on the accent wall, but having spent many frustrating hours scraping unwanted wallpaper in previous homes, I couldn’t bring myself to go there. Then I found these amazing matte silver dahlia decals from BubbaAndDoodle on Etsy and let me tell you; these are not your mother’s decals. They have no visible border, so they look as though they have been stenciled or hand-painted right on the wall. 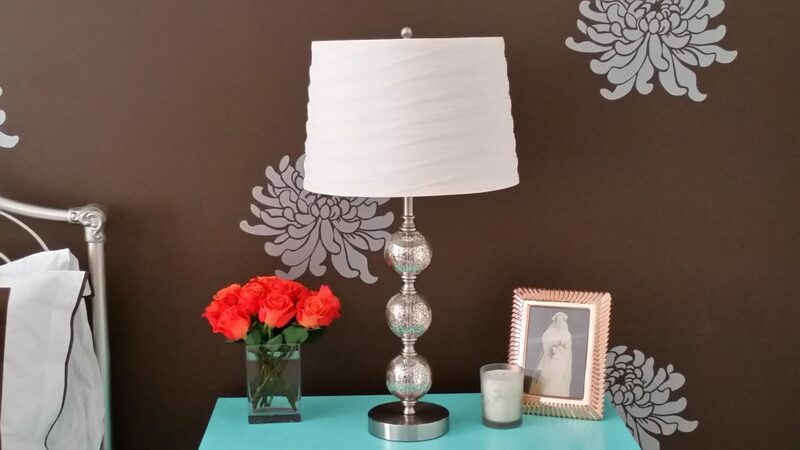 With these large-scale blooms, you can achieve a high-end wallpaper look using a relatively small number of decals. If you want even more drama, you could purchase a single huge decal to serve as a focal point over a piece of furniture. The application takes a little bit of patience, but once you get the hang of it, they are pretty easy to work with. Even more important to a crazy serial DIY decorator like me–they are easy to remove! The following YouTube video by decalmywall.com gives an excellent explanation of how to apply vinyl decals. I would offer a few tips of my own which I discovered by trial and error while working with these decals. Do use the scraper (which came with the stencils) or a credit card to firmly and thoroughly go over both the front film paper and the backing paper of the stencil before attempting to peel off the backing paper. This is essential to getting the papers to release easily. If you are not dealing with a multi-piece large-scale stencil, it is easier to peel off the backing paper on a flat horizontal surface prior to taping it to the wall. Placement is a bit trickier this way, as once you’ve removed the backing paper, you must position your stencil with the sticky film paper exposed. Go very slowly when removing both backing paper and film. This way you can catch and adjust the stencil when it inevitably sticks to the paper. 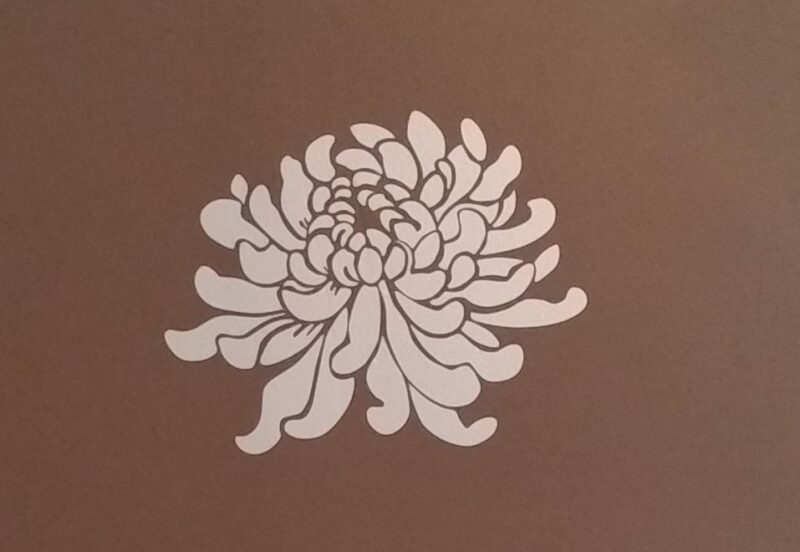 You can use an Exacto knife to catch and hold down the stencil when it tries to stick to the backing paper. The scraper works well to hold the stencil down on the wall as you remove the film paper. Since I wanted the flowers to have a random look, I eyeballed the location of the decals and marked the position with yellow post-it notes. I then taped the cut out decal in place with painters tape. I won’t say that I am getting used to seeing my daughter’s vacated room, but I will confess that the subtle sheen of her newly-decaled wall has definitely taken some of the sting out of her exodus. 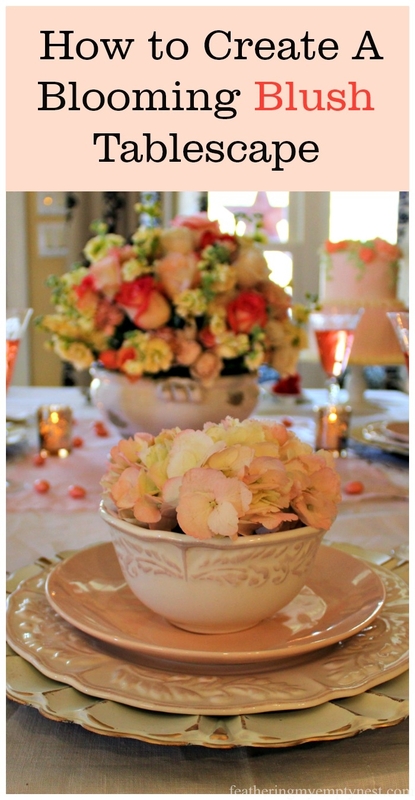 Maybe one woman’s crazy need to decorate is another woman’s therapy. Previous Post Don’t Get Knick-Knack Paddywhacked! Wow, those decals look so cool, almost like wallpaper, but updated and modern. In my old apartment I had an elaborate elephant decal that took forever to put up, but once it was there it looked so gorgeous! I loved the contrast of the brown and teal. I agree the decals are awesome . Thanks so much for taking the time to comment on my blog. It means so much to me that you are reading it! 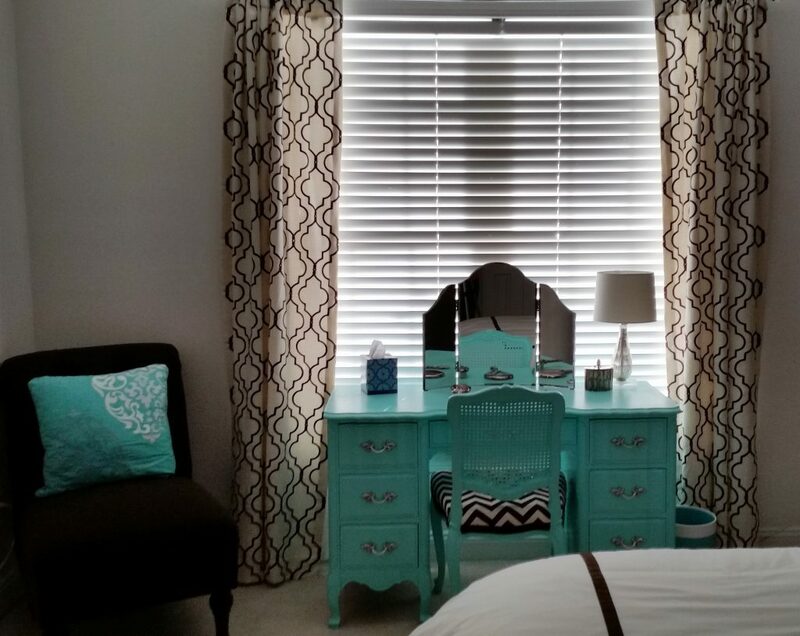 Wow – the way you describe how you changed your daughter’s room as she grew older brings back such memories. I wasn’t as crazy as you were – I am a little jealous, though. The decal idea is awesome! And “fancying up” your daughter’s room as sort of a bribe to get her to visit is also really smart. Good tips for applying decals! I’m going to remember these when I do my own walls soon. When I think about redoing a room in my house, the cost and hassle leaves me feeling defeated before I even get started. 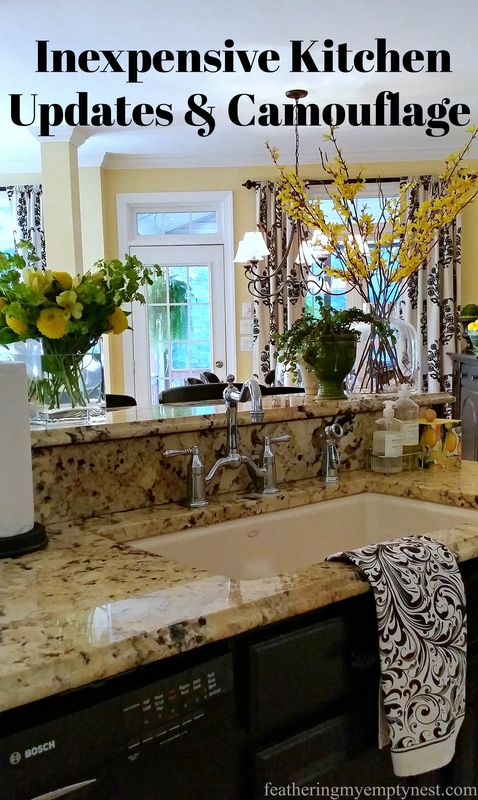 It is inspiring to see such a designer-worthy result from a diy effort on a budget. I also really admire your resolve to repurpose your furniture instead of just chucking it in a landfill! The entire room looks very sophisticated. The decals on the wall simply look like wallpaper, not like they were added later. You did a great job with spacing the decals. I love this look — very serene, but also creates interest. I enjoyed your trip down memory lane about the incarnations of the room. Thanks so much. I wish I had pictures of the different incarnations of my kids’ rooms but at least both they and I have good memories of all the happy story time, snuggling, and heart to heart talks that took place in those rooms. Oh I love the decals. I have always loved brown and blue together (those are the main colors of the interior of my house.) Looks fantastic. I thought of something something similar with stencils but was intimidated. Will have to revisit the idea with decals. Thanks for the inspiration. You are very welcome. Thanks for taking the time to comment on my post. I’ve done some stenciling in the past and I can tell you that the decals are way easier.